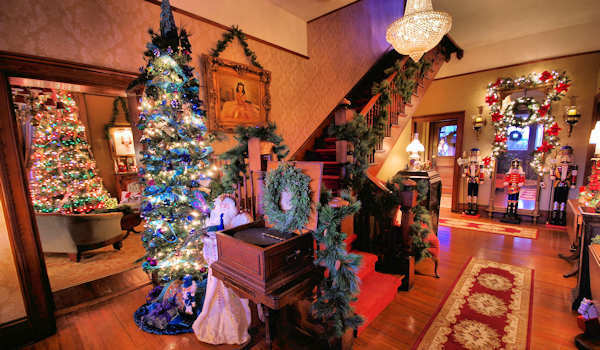 If you love grand, historic homes decked out for the Christmas season, you should stay the night in The Reynolds Mansion Bed and Breakfast in Asheville! You'll feel like royalty when you awake to a 3-course breakfast in the Dining Room with an elegant table that can seat 24 people (pic above). After, enjoy coffee in the Parlor or on the front porch. 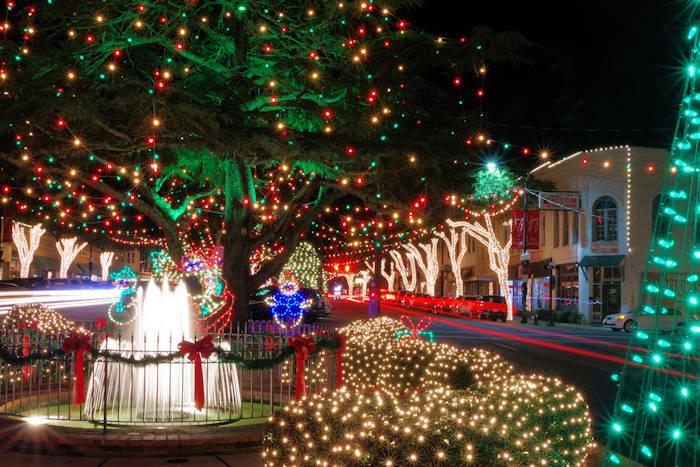 You'll definitely see what makes a B&B stay during the holidays so special and romantic. Enjoy your photo tour! 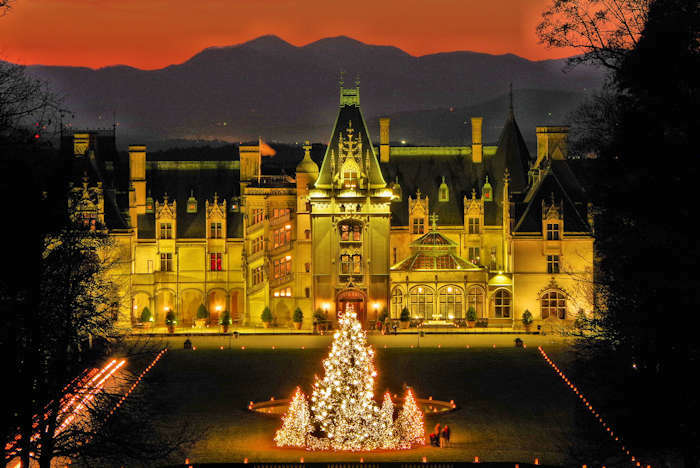 During this very romantic getaway, learn fascinating stories of the many generations that lived in one of the oldest homes in western North Carolina. But no ghosts! Built almost 50 years before Biltmore House, “Colonel” Daniel Reynolds completed his imposing “double pile” brick home on a knoll of Reynolds Mountain in 1847 (5 miles north of downtown Asheville) on 1,500 acres of farmland. They had 10 children! It was inherited by his son William. William's son Robert became a U.S. Senator in the 1930s. It stayed in the Reynolds family until the early 1960s. Current owners Michael Griffith and Billy Sanders saved the Mansion from demolition in 2009 and returned the Mansion to its glory with all the modern amenities and most of the original furnishings. Imagine sleeping and snuggling in this canopy bed in the Claudette Room with 16-foot ceilings. 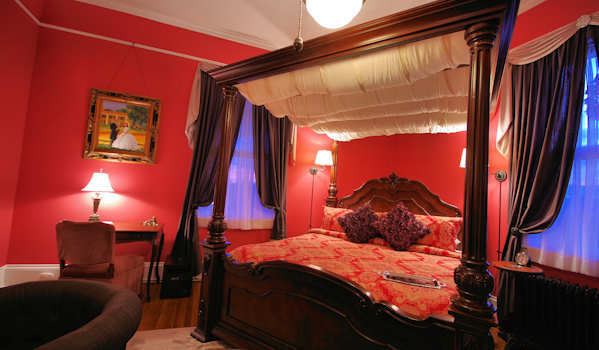 It's one of eight bedrooms in the mansion. The inn is a member of the Asheville Bed & Breakfast Association and contributor to their new cookbook. 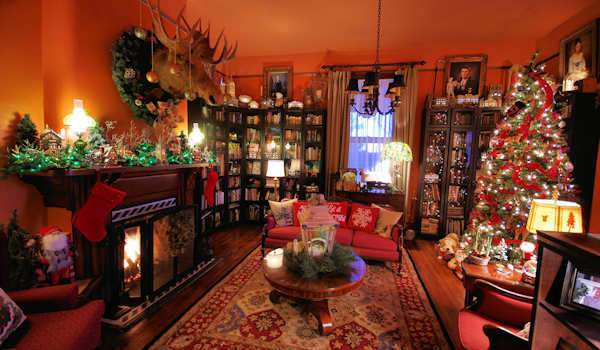 The Library features a tree with Billy's personal ornaments and a festive moose. It's just one of 10 decorated Christmas trees. 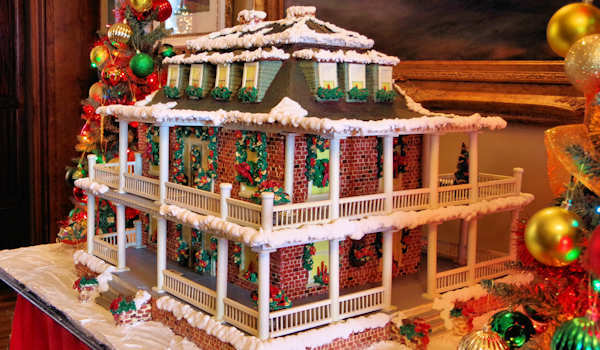 See the amazing gingerbread house replica of the Reynolds Mansion. Interesting tidbit: the third story of the Mansion, double verandahs and indoor kitchen were added in the early 1900s, giving the house its Colonial Revival style. 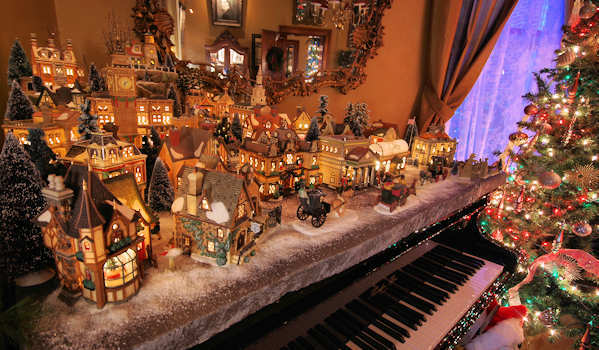 If you love the Department 56 Snow Villages, you will be in heaven here. One of the owners happens to be the President of Department 56! Find many rare collectibles in the Parlor and other rooms. Innkeeper Billy loves to share the many stories of the home, the Reynolds family and the renovation. Senator Robert Rice Reynolds, known locally as "Our Bob", was born at the Mansion in 1884 and lived there his entire life (died in 1963). He served in office from 1932-1945. Reynolds supported Roosevelt’s New Deal and the Civilian Conservation Corps, providing many jobs for North Carolinians and allowing the Blue Ridge Parkway and the Great Smoky Mountains National Park to be built. He died in 1968. See a replica of the Hope Diamond in the Parlor. 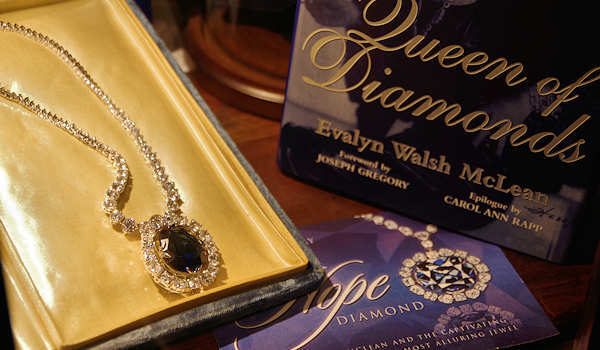 The famous, cursed 45-carat blue Hope Diamond was once owned by the mother of Evalyn McLean, the fifth wife of Senator Reynolds (married in 1941). Evidently, she was a victim of the curse, dying in 1946 from an overdose inside the Mansion. The diamond was willed to Evalyn's daughter, but the estate sold the diamond instead in 1949. In 1958, the Hope Diamond was donated to the Smithsonian Museum. The house was sold out of the Reynolds family in the early 1960s and went through 2 other owners before Fred & Helen Faber bought it in 1970. After renovations, they opened the home first as a B&B in 1972. On September 13, 1984, The Reynolds Mansion was listed on the National Registry of Historic Places and placed in a protected status. Fewer than ten brick houses still survive in western North Carolina from before the Civil War and The Reynolds Mansion is one of them. With the development of Reynolds Village with condos, offices and stores, the home was targeted for demolition. In October 2009, Michael & Billy bought the home and began a painstaking restoration, adhering to strict preservation guidelines. 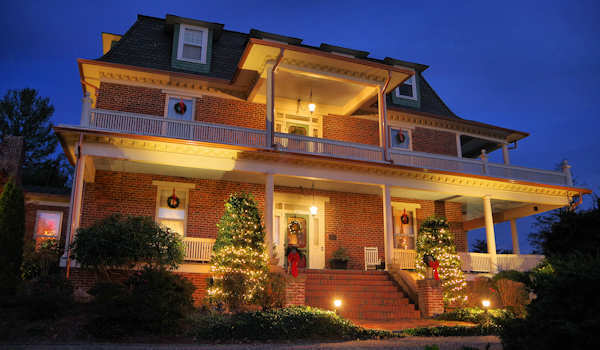 They opened the "new" Reynolds Mansion Bed & Breakfast Inn in April 2010. We are so lucky they saved such an amazing home with such a rich history.